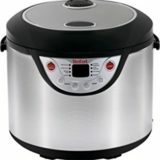 This cylindrical kitchen appliance has four functions: slow cooker, steamer, rice cooker and porridge maker. 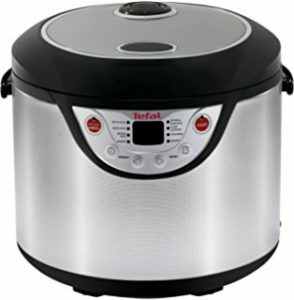 It is an older model and Tefal has now produced an 8-in-1 model which is an update and improvement on the 4-in-1. This appliance offers to space precious kitchen space by sitting snugly on the counter and fulfilling its four functions without the need for four different machines. The machine promises fluffy, well-cooked rice, delicate steamed foods, cosy porridge and a wealth of delicious slow-cooked dishes with minimal effort for maximum result. Julie bought this appliance thinking that it would serve as an upgrade for her current slow cooker. Her first use was the rice cooker. She used the quantities recommended in the book, but found that the rice came out slightly burned and stodgy. The next time, and thereafter, she used the amount of rice she would use when cooking rice on the hob: two cups of water to one of rice – this worked effectively, and she was very happy with the rice from then on. Next, she wanted to make a savoury stew, and happily chopped her veg and seared the meat to seal in the flavour. She found the quantity held by the slow cooker to be a little disappointing – she only cooks for two, but likes to make extra portions to freeze for lazy days – and that it held much less than she had expected. Switching on the slow cooker, she looked in vain for a high/ low switch. The Tefal 4-in-1 only cooks on low, but the manual does not say this anywhere! Julie worked it out by letting her stew cook for seven or eight hours: when she checked it after four hours, it was disappointingly uncooked. The porridge maker was competent, making properly cooked but unexciting porridge. The sticky dried-out porridge left after she had served the porridge took longer to clean up than it would have taken for Julie to simply make the porridge on the hob. Steaming too was alright, but nothing very exciting – Julie said she expected more from the steamer function! User-Friendly: The 4-in-1 is easy enough to use except for the odd pieces of information that are left out or that are misleading: such as the slow-cooker settings and the water-rice ratio. The lift-out vessel is easy to clean, but care must be taken not to scratch it. The porridge feature is unlikely to be used – it is easier to cook porridge on the hob, and easier still, and quicker, to make it in the microwave. The rice cooker works well, once the ratio has been adjusted, as does the steamer. The slow cooker makes nice small stews, but takes a long time to do so, with no ‘high’ setting. One issue is that one cannot have rice, and steamed veg and a stew, all at the same time – unless one uses the cooker, or invests in more appliances… 60%.